When using this code for other wikis, the user group name should be adjusted accordingly. This will show a page with the title "Permissions errors" to the user trying to access it. // Info Screen for unregistered users and users how are not part of the 'gfbioUser' group. banner.innerHTML = "<h3>Login Required</h3> <p>This is the <strong>internal wiki</strong> of the GFBio Project.</p><p>To view the content of this wiki, you need: </p><ul><li>to <a href=\"https://gfbio.biowikifarm.net/internal/Special:RequestAccount\">request an account for the biowikifarm</a>. In the description you need to specify, that you are part of the GFBio team. </li></ul> or, if you already have a biowikifarm account, <ul><li>you need to have this account approved for this wiki. 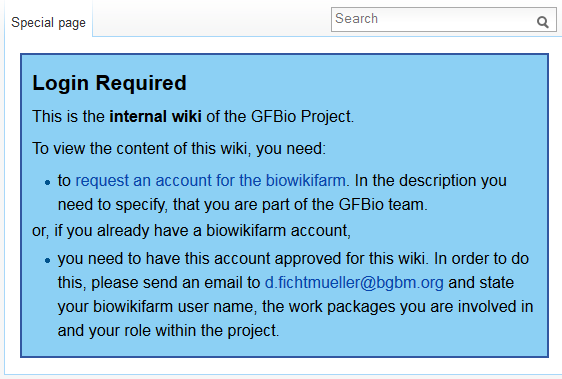 In order to do this, please send an email to <a href=\"mailto:d.fichtmueller@bgbm.org?subject=Approve account for GFBio wiki&body=My biowikifarm username is: "+username+"%0D%0AWork package(s):%0D%0ARole:\">d.fichtmueller@bgbm.org</a> and state your biowikifarm user name, the work packages you are involved in and your role within the project.</li></ul><p></p></div>"
If you want to adapt this script to another wiki, change the HTML and the required user group. In order for the users of a wiki with a protected namespace to be able to access this namespace they have to be added to the corresponding user group. To streamline this process, there is a script which helps the users of the bureaucrat user group (those that can adjust the user groups of other users) to add user to the special user group of the wiki. 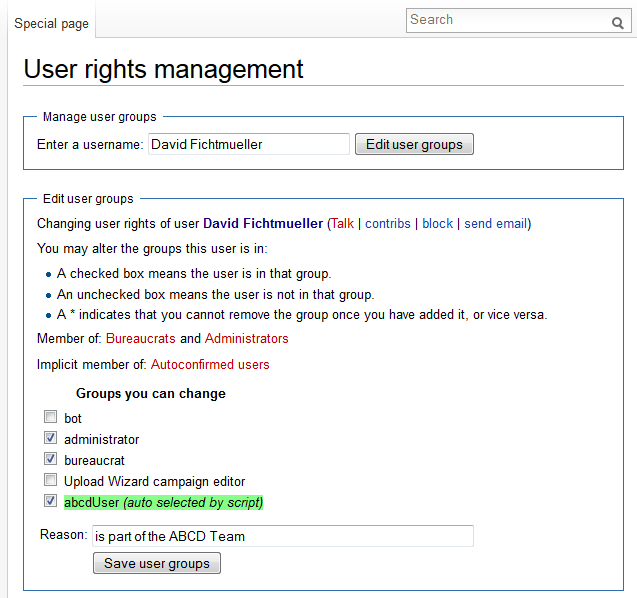 when on the rights page of a user, it automatically preselects the user group of the wiki and adds a comment for the rights log. The bureaucrat only has to click save. To not accidentally assign rights to users that they should not have, the new user group is highlighted in bright green if it has been selected by the script. In order to user the script, save the following code as MediaWiki:EasyAccountApproval.js and adjust adjust all //TODOs to fit the wiki you are working with. This page was last modified on 4 February 2015, at 16:12.